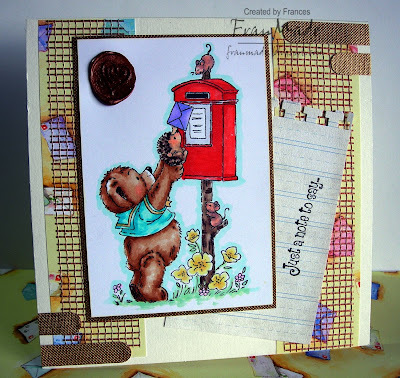 I've hade this cute bear coloured up for about a week now so wanted to make it up into a card but could I get the layout to look right? no! Everything I tried just wasn't doing it for me but in the end I gave up and thought this was as good as it was going to get and I was starting to get sick of the sight of it (ever get like that? Think I'm in one of my creative dips again - must be the weather). 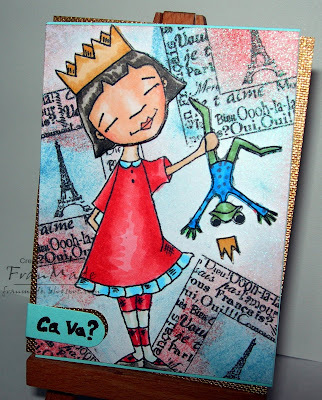 So I'm afraid I've not done justice to the fab sketch over on Sketch Sat and the only thing I like about this card is the colouring and the wax seal I used in the corner! Oh well, we all have off days or at least, I do! Spoke too soon about the weather and Wimbledon then as the roof got put into good use last night didn't it? What a match, talk about endurance test . . seemed to go on forever! Paper: not sure! just piece I found with envelope pattern all over it which I thought went with image but ended up not seeing most of it anyway! Anyway, back to my card and some exciting news. Whiff of Joy stamps is 1 year old (Can't believe I've been lucky enough to have been there from the start, it doesn't seem that long)! 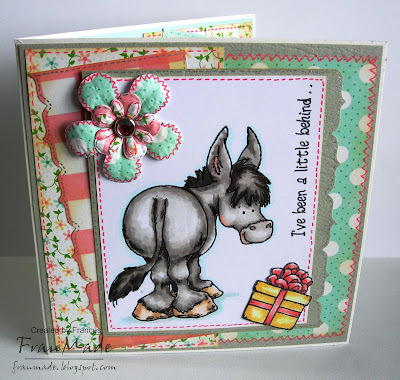 Katharina will be hosting a party on the 25th July, starting with a blog hop of the next new release. 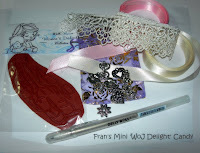 As well as the DT she will be picking 15 WoJ fans to take part in this blog hop. 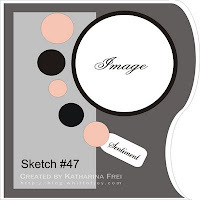 All you need to do, to be considered, is to take part in the sketch challenge over on Katharina's blog. For full details just click on the banner above. Colouring: Copics. Masked Willow and sponged around her with distress inks to match the dp. Have a lovely evening, thanks for dropping by. Hellooo! Have you missed me?! Had a fabulous time in Paris. We chose the perfect time to go as the weather was just right (sunny but not too hot) and we left just as it was forecast to rain that day! Looks like the weather's been fab here to as we came back to wonderful sunshine too. 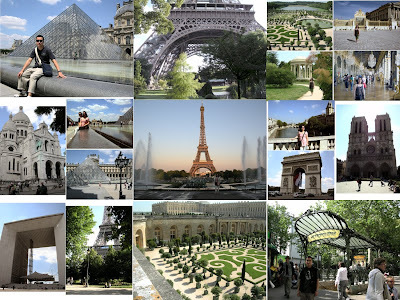 Took way too many photos so just selected a few and made a little montage to show you. Walked so much, my poor feet need another holiday but it was worth it as the sights and views were spectacular. Not managed to get back in the craft room yet (unpacking is always the worst bit of holidays isn't it?!) 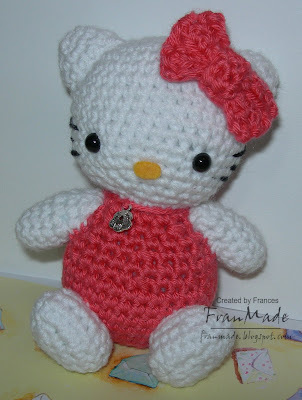 but remember I said I would be attempting to crochet a little Hello Kitty? Well I did and it was finished before I left but didn't have time to schedule a post, so here it is now. This one isn't quite correct as the eyes should be oval not rounf but I just used what I had to hand and I got the head bit slightly wrong but think it turned out o.k! Currently trying a different one, slightly bigger but I do like this dinky size (it's about 4 inches high). (If anyone is wondering, patterns are from Japanese crochet books which you can buy on ebay/etsy). Once I've perfected it a bit I'll be making some as little gifts for my nieces I think. I'm working tonight and tomorrow now so will leave it till start of new week to start posting again. I will also be doing a blog candy soon as July is around the corner which means my birthday is too, and I've gone past 100,000 hits, so watch this space. Thanks for all the comments and visits whilst I've been away and I will try and catch up soon. T&F ATC 3D Fun: Ca Va? Bonjour! Ca Va? indeed. Hope you are all 'ca va bien' - All things being well I should be enjoying some Parisian sunshine and taking in the sights of Versailles today. Hopefully blogger is behaving as this is a scheduled post. Did my usual quick background stamping and sponging with distress inks followed by spritz of perfect pearls and image coloured with Copics. Afraid I ran out of time so no CCT card tomorrow but I'll catch up when I get back. WoJ this week wants to see paper piercing and the colours over on Copic colour challenge matched the scraps of DP I had out on my desk so I've killed 2 birds with one stone as I've left it last minute (as usual) and still need to pack for our trip to Paris tomorrow plus I want to try and get my DT cards done so I can schedule those to post whilst I'm away (but don't hold me to it!). Right, must go and pack my clothes (trying to pack light but not easy when indecisive like me) and whip up couple of DT things and schedule those for the week as I won't be around till Thursday now. So have a super week and au revoir! CCT wants to see tags this week - so it could be a tag card or just a tag somewhere on your card. I went for the easy option and used a tag and thought I'd use a Sarah Kay image which I haven't used for a very long time (this one is the first time it's been inked!). Others: labels nesties (can never remember what number the sets are) just used technique to cut around her head and traced around the nestie to get the larger brown mat (which is scrap piece of packaging I saved as it has lovely wood grain effect pattern printed on it), raffia ribbon, paper twine, roses, Fiskars apron lace border punch and MS branch punch. Right, need to go get my haircut today (nothing major, it's always some sort of a mid length bob which ends up growing out until I can't ignore it anymore and it needs another prune) and think about what I need for next week's little jaunt to Paris. Sorry not been blog hopping recently but haven't been in the mood what with my cold but feel better today so will try and come say hello later tonight. Have a lovely day, even if the weather's miserable like it is here! 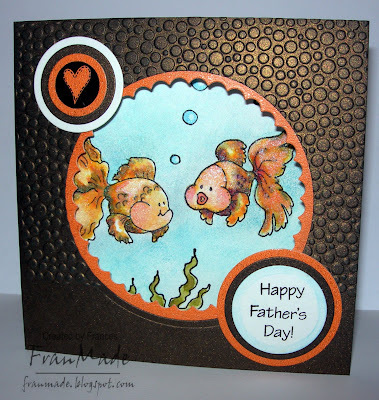 T & F's ATC theme this week is 'father's day'. Needed something quick again last night (just wasn't feeling crafty yesterday - my cold was at that horrible congested chest/coughy stage and all I wanted to do was curl up in bed and watch trashy daytime tv - does wonders!). So anyway, didn't want to, 'not do my bit', so had a think of what would be quick and came up with this 'fella' stamp (Stamping Bella's other half). Coloured him with Copics (and realised afterwards I didn't really need to have coloured him with shading as he's not fully 3D anyway - he's got stick arms!) 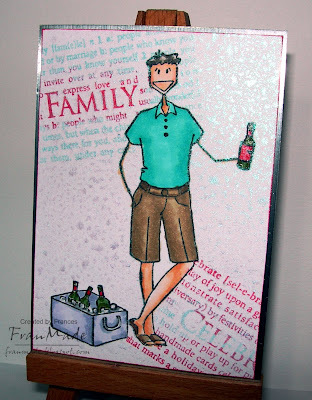 To jazz up the background I just masked him off then stamped some text stamps (old Hero arts set) randomly behind him and then spritzed some of my home made shimmer over it (water & perfect pearls in spritzer bottle - just make sure you spray inside an old cardboard box to contain the mess!) Then I just matted it all onto scrap piece of silver mirri card. Simple but effective I hope, really pleased with the shimmery background - might see it better if you click on photo. So may not be posting as much over this weekend as got stuff to sort out and any crafty things I will make I will be eeking them out so that I can schedule some posts whilst I am away but I'll be back tomorrow. see you then & thanks for stopping by. 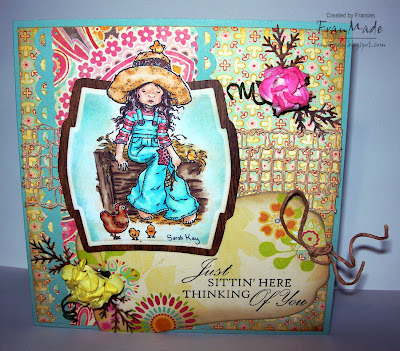 Just a quick card today or else I'll miss spoonful challenge deadline. They want to see butterflies so I've obliged by adding a little punch out one in the corner! 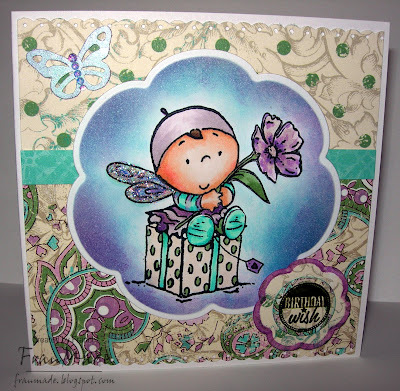 The cutie patootie I've used is from set of 'Fairy doodles' stamps (set 343). It's very 3D in real life as I've decoupaged her head, arms, flower and 2 feet but it doesn't look it in photo! 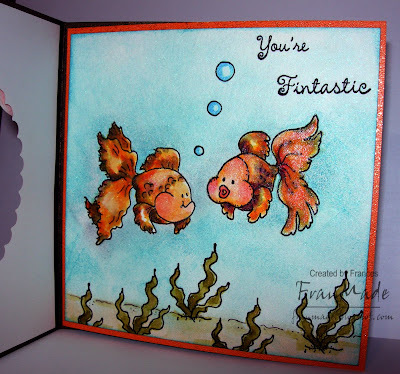 Images: 'Fairy Doodles set 343' clear stamp set. 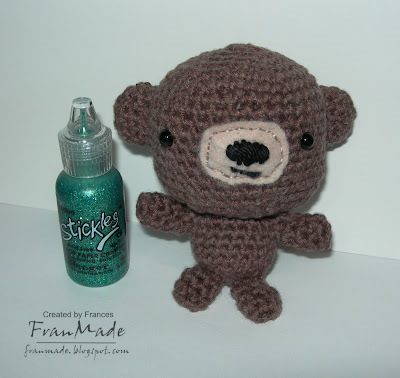 There are 3 other sets which are equally adorable and are available over at Silly Monkeys . Used the sketch over on WoJ for this one (but put my sentiment in bottom corner rather than top left as it didn't look right on mine). I'm attempting to do a little hello kitty next, so will see how that turns out.
. . . thanks for all the entries (130) so without further ado the winner is . . .
which means it's . . . So, if you could email me your addy, this little lot is yours! If you weren't lucky you can always try Katharina who is having her usual WoJ new release candy over on her blog (got few hours left) or failing that, you can go buy them as they are now released- so go get them! Right I'm off to bed, got stinking cold (that plus hayfever yesterday - not good :( ) Hopefully should have another WoJ card to show you later today depending on how I feel - just need to stick it all together and add the finishing touches. Wanted to make some 'fun- cute' cards for a break from all the 'pretty/feminine' cards I've been making (else they get a bit samey and mojo goes!). So dug out my High Hopes and made father's day card for FIL (before hubby asks for one last minute!) 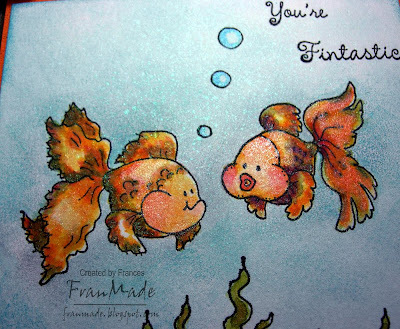 and then as I needed a belated birthday card for my friend, found the perfect sentiment and image for it. For speed, I used the sketch over on High Hopes this week. 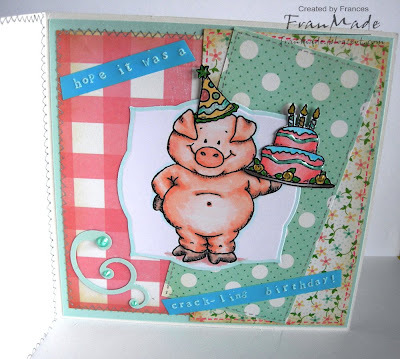 So here's the belated birthday card using Nikki's sketch over on High Hopes challenge. where I've used sketch both on the front . 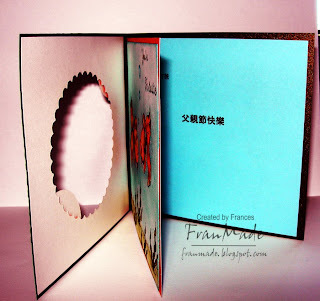 . .
Papers: Making Memories 'flower patch' pad. 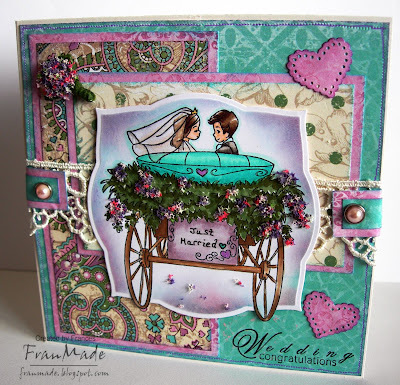 Others: Fiskars border punch, retro flower punches to make flower on the front, EK flourish punch inside and lots of faux stitching around all edges with a pink and silver gel pen. I'll leave you with this shot of the fish where you can hopefully see all the shimmer on them and in the 'water' around them. CCT wants to see quotes on your cards this week. 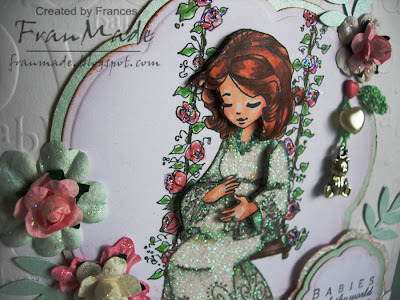 I've chosen one of the fab little quotes you get in the babies sentiment set from WoJ and teamed it with this beautiful pregnant Willow stamp and the little floral swing again (release date this Sun, 14th). She looked so elegant that I had to paperpierce her a shimmery frock! Also thought I'd give her a different hair colour to my usual black, so today, she's got lovely deep rich auburn locks! Sorry for the poor photo but lighting was terrible when I took it yesterday (where's the sunlight/summer gone?!) 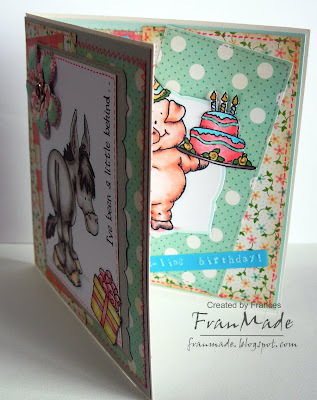 Used a ready embossed cardblank with the word 'baby' all over it so no patterned papers needed for this. Just chose this lovely pale aqua/mint pearlescent cardstockas there's flashes of that colour in the glitter of her dress and used that as my accent colour to mat my central image and the quote - all cut with nesties (My image was cut using the largest nestie die so to create the bigger blue mat behind it I just traced around the largest die and cut it out by hand). Again, was supposed to be simple but just couldn't stop myself from adding some roses and embellies! Dodgy photo means I've not captured the sparkle in her dress and the fact that I've decoupaged her head and 2 arms (one of which went walkabout and I nearly lost it LOL). Ooo, just realised I can enter this into this week's ABC challenge of R for roses :) too. 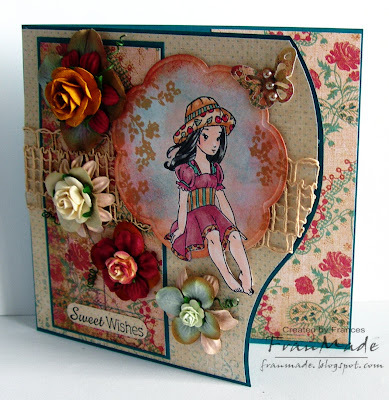 Others: embossed cardblank, glitter paper and blue cardstock, 'blossom' nesties, MS frond leaf punch, prima flowers, paper roses, ribbon. Teddy metal charm (which I forgot I had until I went to get some out for my candy!) and heart pearl charm crocheted together on a chain with a little leaf on the end which I then attached to card with hear brad. I liked how this turned out and so did hubby which is unusual as these ones aren't usually his cup of tea. Thanks for stopping by and for all the lovely comments about my cards and colouring this week too - always makes me happy to read them and much appreciated. 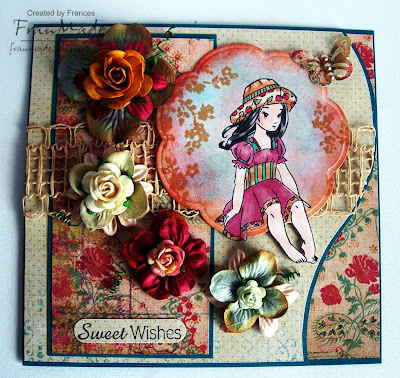 It's Wed, which means ATC time and something just for a bit of fun. 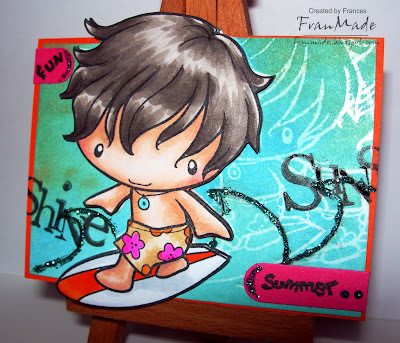 This week's theme is 'summer fun' so anything summer inspired. I thought it was perfect excuse to ink up Surfer Ian from The Greeting Farm. Hope it brings a bit of summer to you, sure could do with some here! Don't forget to pop on over to see the rest of the DT's summer fun and maybe join in too (great for trying out ideas and if you're a colouring junkie like me :)). Have a super Wednesday. WoJ Peview delight & candy!